i've been painting my nails since i can remember. i don't ever remember my mom painting my nails although i am sure she did. painted nails make me feel pretty, and naked nails drive me crazy. a lot of people love shellac. i have a light, and sometimes i use it. most of the time i stick with regular polish, but i follow all the steps. 1. trim/file nails to desired length/shape 2. push back cuticles 3. buff 4. base coat (currently using essie nail strengthener)x2 5. color x 2 (cheap polish chips-i prefer essie or OPI) 6. top coat (currently using sally hansen) 7. finish with cuticle oil if desired if i follow all the steps, my polish usually lasts 5-7 days. i wash my hands and use hand sanitizer throughout the day, and they still stay pretty well. do you prefer naked or painted nails? 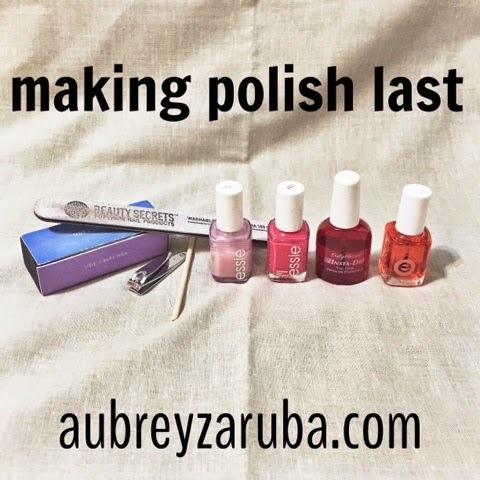 what are your steps or tricks to making polish last? i'll be back next week with some of my fave spring colors. I have the hardest time painting my fingernails because they chip so quickly with everything that I do. Even just typing at work, my polish has chipped :P I really love the shellac stuff though and one day I'm going to buy a light and just a top coat because I think just the top coat would make nail polish my finger's best friend! I love, love, love my painted nails! I really need a bottom coat, that's the only one of your steps I don't do! I don't really use nail polish any more because it always chips so quickly. I've tried almost all of these steps but the cuticle oil which I'll have to try. I do like the Sally Hansen stickers and the Gel polish with out the light. They tend to stay on my nails longer! I love painted nails and I actually have been using a gel coat to keep my manis popping for like 10 days. It is AWESOME! I feel the same way! I just feel prettier when my nails are painted :) I've been using the Revlon gel nail polish. It last almost 2 weeks. Or I just use the Revlon gel topcoat on any of my polishes to make them last longer. So I just started using Jamberry, not sure if you've heard of it or not. But they are similar to the Essie nail strips-well they are hands down AWESOME!! I'm so sick of painting my nails, but these are great! Check them out! Last two weeks! :) I wrote a review on my site, if you want to check it out. Polish that lasts is key! I'm all about the manicure - only if I can make it last, though! 5-7 days is still not long enough for me. I want a solution that is 2-3 weeks. I'm not a fan of Jamberry because I can't seem to get those dang things on right. The only solution that I know of is to get gels put on.